Both Bernd and Hilla were born in Germany. Bernd studied painting and lithography at the Staatliche Akademie der Bildenden Künste Stuttgart until 1956 and then typography at the Kunstakademie Düsseldorf until 1961. Hilla also attended Kunstakademie Düsseldorf at the same time where she studied photography and met Bernd. The pair married in 1961 and began a life-long collaboration of art and photography. Sol LeWitt (b. 1928) was an American conceptual artist well known for his wall drawings and “structures,” as he described his sculptural work. Carl Andre (b. 1935) is an American minimalist artist well known for grid format sculptures. The two met the Bechers through an introduction by a gallery owner in Germany in the 1960’s. It is the Bechers’ consistent commitment to the same set of rigorous constraints that elevate their work from photography to conceptual art. From looking at their work and reading about them it seems to me that their main driver was they were pursuing something about the world that interested them. They were interested in documenting the industrial structures present in the German landscape and doing it in such a way that we could closely examine the structures themselves when the other distractions were taken away. This new way of seeing resonated with the art world and attracted LeWitt and Andre to the Bechers’ work. 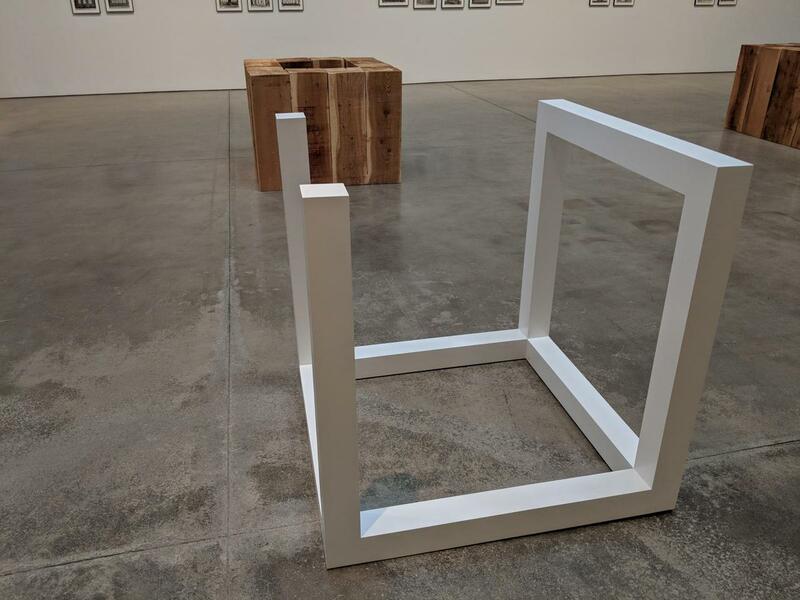 While viewing Andre’s series Hollow Square (2008) my attention was directed to the identically cut square pieces of lumber material and their arrangement in a square, revealing a hollow space inside. This positioning compelled me to contemplate the wood material in a way that eliminates the distraction of a more complex form. Also on display were a few structures from LeWitt’s series Incomplete Open Cubes (1974). LeWitt wanted us to think about a cube and all the possible permutations of incomplete cubes. He said of the work that when “you look at it, it becomes chaos” but when “you see it in other lines of sight it becomes orderly again.” This arrangement provides us with a new way of seeing and thinking about the cubic form. Bernd and Hilla Becher were prominent conceptual artists and photographers. Their rigorous methodology for taking photographs provided a new way of seeing industrial structures, resonating with other conceptual artists like Carl Andre and Sol LeWitt. Wikipedia contributors. "Bernd and Hilla Becher." Wikipedia, The Free Encyclopedia. Wikipedia, The Free Encyclopedia, 13 Apr. 2018. Web. 15 Apr. 2018. Wikipedia contributors. "Hilla Becher." Wikipedia, The Free Encyclopedia. Wikipedia, The Free Encyclopedia, 7 Apr. 2018. Web. 15 Apr. 2018. Wikipedia contributors. "Sol LeWitt." Wikipedia, The Free Encyclopedia. Wikipedia, The Free Encyclopedia, 15 Apr. 2018. Web. 15 Apr. 2018. Wikipedia contributors. "Carl Andre." Wikipedia, The Free Encyclopedia. Wikipedia, The Free Encyclopedia, 13 Apr. 2018. Web. 15 Apr. 2018. O'Hagan, Sean. “How Hilla Becher found beauty and dignity in industrial decline.” The Guardian. 15 Oct. 2015. Web. 14 Apr. 2018. San Francisco Museum of Modern Art. “Sol LeWitt's Incomplete Open Cubes.” YouTube Clip. 18 Sept. 2013. Web. 14 Apr. 2018. Guggenheim Museum. 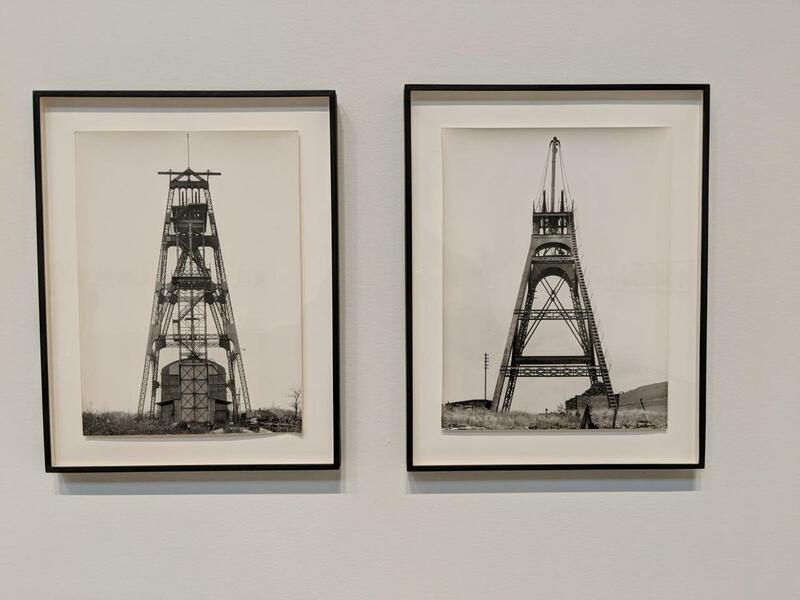 “Bernd + Hilla Becher.” Guggenheim Museum. Web. 14 Apr. 2018.